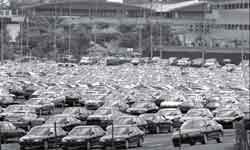 Look at all the unsold parked cars in Proton’s factory in Shah Alam. Manufacturing capacity doesn’t seem to be a problem for Proton. The problem is selling all the cars. Somehow Proton does not realise that it’s declining sales are because the we, the rakyat are sick of them shortchanging us on the quality control issues. The export market Protons are of so much higher quality than ours. Proton Persona vs. Proton Wira. Anyone would take the Persona anyday. Proton used to hold 60% of the auto industry but it’s share dropped to 44% last year, a steady decline from 48% in 2003. Malaysia’s national carmaker Proton is blaming a flood of low-cost foreign imports for cutting its market share, but critics say the real problems are its “cheap” image and poor track record. Proton’s arch defender Mahathir Mohamad, the former premier who launched the ambitious national car scheme in the 1980s, said last week unfairly priced foreign imports were making it hard for Proton to compete, and called for more restrictions. In happier times, Proton used to sell six out of every 10 new cars in Malaysia, but growing foreign competition has seen its share of the market fall to 44 percent in 2004 from 48 percent in 2003, and the outlook is poor. Toyotas, Nissans and Kias already crowd the nation’s roads, and many more will come as the high excise taxes and import duties which have protected Proton are stripped away under a regional trade pact that comes into full force in 2008. Industry analysts and car owners say Proton needs to address its perennial bugbears – poor assembly and after-sales care, and high maintenance costs – to achieve its goals of boosting both domestic sales and exports. Far from being proud of owning the national car, many Proton drivers say they only opted for one because they could not afford an import, and after unhappy experiences, they plan to switch to a foreign model when they can. Proton’s 1.6 litre Waja sedan is considered among the best of the nine-model range, but businessman Y.S. Chong told AFP that while his Waja “so far is okay” he would not buy another national car if he could help it. Lim Boon Ling, a 39-year-old property executive, aired similar sentiments as he strolled around a Proton dealership in suburban Kuala Lumpur, saying Proton had gone for style over substance when building its vehicles. “The design of Proton cars is OK, but the parts are flimsy and of poor quality,” he said, adding that many people were put off the brand because of maintenance problems. Lim, who despite his misgivings was considering buying a Waja because of its competitive price, also checked out Proton’s latest addition, the Savvy compact. It was launched last Wednesday, marking Proton’s return to the small-car segment after a decade-long absence. “This model will fail. They launched it late compared to Perodua’s new Myvi compact car,” he said, referring to the Perusahaan Otomobil Nasional Kedua (Perodua) model which has become one of the country’s top-selling cars. The Myvi, developed in collaboration with Perodua’s major shareholder Daihatsu Motor Co. of Japan, is priced at about 50,000 ringgit (US$13,158) compared to the Savvy at about 40,000 ringgit. Proton officials admit privately that negative public perception is the greatest obstacle to increasing sales and penetrating foreign markets, and that they need to change the mindset and improve after-sales service. “We want to move away from this image that we sell cars that are cheap, or even cheaper than cheap,” a spokesman said last week. In the face of the flood of imports, Proton is aiming to bolster its bottom line by selling at least 100,000 vehicles abroad annually by 2008. Exports have doubled from a tiny 8,000 units in 2003 to 17,000 in 2004 and it has set a goal to double overseas sales in 2005. But industry analysts say that despite its plans, Proton is slow on its feet, with a long time lag between new offerings. Also, the poor quality of some models is hurting its overall reputation. “Proton must be hungry for new models,” an auto analyst with a local brokerage told AFP. “If you look at Perdana and Waja models, it is good. But the smaller cars like GEN.2 and Tiara, the quality is low. This is affecting Proton’s image,” she said. The analyst pointed out that Proton is as old as Hyundai but the South Korean maker is exporting up to 2.0 million cars annually compared to 17,000 from Proton. Mahathir, who is an adviser to Proton, said last week that critics must be patient with the automaker, and insisted that the national car project had wider benefits to Malaysia. “The idea of a national car is not to beat our chest. We want to modernize our country through skills development,” he said. But Mahathir said Proton must remain competitive. “If labor cost is high, maybe we may not be able to compete and maybe we will say goodbye to Proton,” he warned. Next Post: Why Can’t Karamjit Singh Secure Sponsorship?